You can find more pictures in this photobucket album! 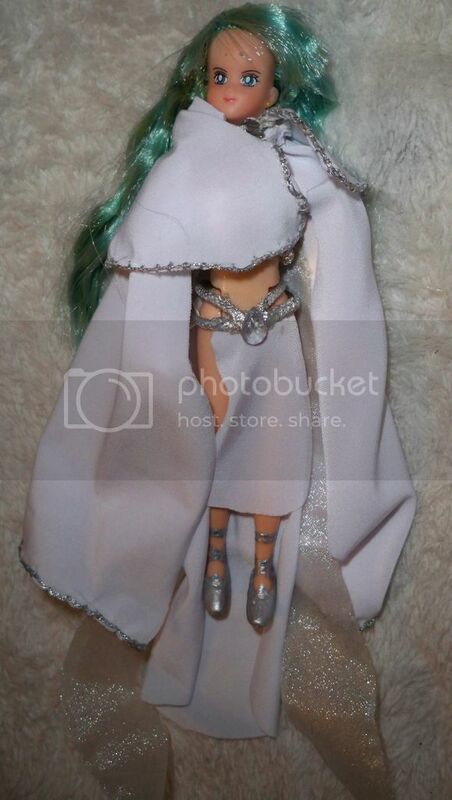 There are other dolls in it as well, but this is the one you're voting for. It was difficult to get them to fit, so this is probably the best way to show off the submission. Way back, between the release of Path of Radiance and Radiant Dawn, I tried to make my own table top RPG based on Fire Emblem. So I came up with an idea of what if the dark god in the medallion was not really evil and went from there (funny how true that turned out to be in RD). The story I came up with involved a cult that worshiped the dark god, so they kept their location a secret to avoid prosecution/judgement, and had no stigmata against Laguz and Beorc being together (this was before anyone knew what happened to Laguz for having a child with a Beorc). Originally, since it was based of PoR, Crimea was an occupying power in Dain, and so the Queen would naturally travel there occasionally to make sure everything was OK. On the way back from one such trip, Elincia and her entourage vanished, and so the players were a group of volunteers to help find their queen. This was to take place 5 years after PoR. Well, by the time I got the game to a playable state, Radian Dawn came out and messed up my story. Now There was the Laguz loosing their power issue and the whole Yune in the medallion issue. So I had to revise my story a bit to make it fit and I think the plot turned out better then my original one, as it gave me more history to work with. So the story with this commoner heron (her name is Tyr), is that about 30 years or so before the start of the game I was running (so about 5 or so years before the Serenes massacre), she was captured by slavers. The slavers were taking out of Begnion, and happened to cross in the 'cult' of people that followed the dark god (not Yune). These people not only didn't like anyone getting to close to their location, they liked slavers even less, and so ended up liberating the enslaved people and taking them back to their 'town'. Those that rescued Tyr and the others enslaved thought that Tyr was some sort of albino crow, as she had grey wings. Those that were freed were offered shelter and told they could stay if they helped out, with most taking the people up on that offer. She was going to travel back to let the other heron's know that she was OK, when word of the massacre reached he remote enclave. This was hard on her, and Tyr dared not go anywhere near Begnion, for fear that the people would turn on her too. When word of the mad king's quest for finding any surviving Heron Laguz reached them, it was thought best for Tyr to go into hiding for protection. The prophet had things to take care of away from the enclave (mostly working on finding ways to help free their imprisoned god), so her safety was intrusted to the head priest. This turned out to be a mistake, as the head priest was not nearly as pious as he seemed, and schemed to take advantage of having Tyr in his possession. Tyr would occasionally leave her hiding place to attend the occasional festival in disguise, and then return afterwards. During one of these times, the priest modified the place she was hidden so that she could no longer open it from inside, thus trapping her in her hiding place. Eventually the players had ended up in the enclave and discovered the locked up Tyr (who was once again not in great shape from captivity) and freed her. On their way out with Tyr, they ran into the prophet (the players at first thought they'd have to fight him to leave, they were not expecting him to mostly ignore them and go straight to Tyr), who after speaking to Tyr, gave her his cloak (as she was wearing her festival outfit as seen in the picture, which is a bit revealing) and told the players to make sure she stayed safe. He then left to take care of things' back at the enclave. The players told Tyr that there were some surviving Heron Laguz and so decided to take her to see them. Tyr wasn't sure she wanted to actual speak to anyone at the forest, so the players decided to help disguise her so that she could see how things were. So they came up with the plan to dye her wings black (heron wings are a bit pointed, sort of like a crows, so it would be believable from a distance). Sadly the game ended (mostly the players didn't like the math heavy mechanics, and people were graduating) and they didn't get farther then that (there was a lot more to the story, but that the gist of the part with Tyr). There is more to the story (and a lot more characters involved), if you want I can try to tell it. up to you guys. Tyr here is a commoner Heron, so I did some research into what colors herons are, and found that the blue heron has bluish grey wings. I looked all over for nice grey feathers (not the 'craft' ones) and could not find any. I then tried to dye some white feathers grey, and it did not turn out so well, so I ended up going with white, even though she really should have grey feathers. So then I though, well the players did dye her wings black, so I wonder what that would look like, so I made the black wings. Then, after looking for good deals after Christmas and New years, I was looking at stuff at Mijers and saw a grey angel wings ornament. I was like, that is the right color. It was the only one they had (and it was 90% off!) so I bought it. I then went searching all the other Mijers stores to see if I could find more so I could make a nice set of grey wings for Tyr. Sadly, that was the only one I was able to find, so I had to use it as is. 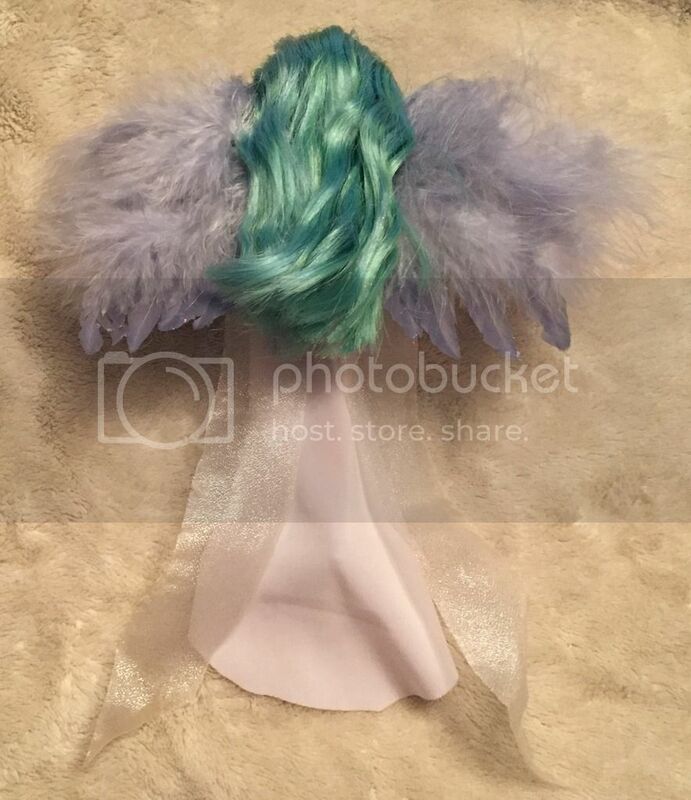 I really want to make her wings the right color and look nice, so I think I'll search e-bay to see if I can find some nice grey feather to make her proper wings. If not, Ill have to settle for the grey angel wings that are in the picture. edit: the reason I went with her, is that I always liked how her character came out in the game, and wanted to bring her a bit more to life. All I had were my notes from that game years ago and the sketches I drew of how she should look. I had forgotten how risque her festival outfit was until I went back and looked at my old drawings. (the 'dark god' was also a fertility god, so the outfit does make sense in context). I figured I should also make the prophet's cloak that was given to her, to complete the look, which is why she has a cloak.